As a large united multi-national state, China is composed of 56 ethnic groups. Among them Han Chinese account for 91.59% of the overall Chinese population and the other 55 make up the remaining 8.41% according to the Fifth National Population Census of 2000. As the combined population of these other ethnic groups is far fewer than that of the Han, they form the 55 ethnic minorities of China. These numerous ethnic groups share China's vast lands but at the same time many live in their individual communities. The relationships between the different ethnic groups have been formed over many years. With a population of 1159.4 million, the Han Chinese can be found in almost every part of China. However, they mainly live in the middle and lower reaches of the Yellow River, Yangtze River and the Pearl River, and also in the Northeast Plain Region (Songliao Plain). They form the largest ethnic group within China and also the largest in the world. Although they make up only a small proportion of the overall Chinese population, the 55 ethnic groups are distributed extensively throughout different regions of China. The regions where they are most concentrated are Southwest China, Northwest China and Northeast China. No matter whether it is Inner Mongolia, Xinjiang, Ningxia, Guangxi, Tibet, Yunnan, Guizhou, Qinghai or Sichuan, Gansu, Hubei, Hunan or another province, one can find Chinese ethnic groups. From the areas listed above, the greatest number of groups can be found in Yunnan Province (25 ethnic groups). Zhuang has the largest population (more than 16 million) of ethnic groups. In order to ensure that the 56 Chinese ethnic groups live together in harmony, the Chinese government introduced a series of policies including ones to secure the equality and unity of ethnic groups, give regional autonomy to ethnic groups and promote respect for the faith and customs of ethnic groups. Among these the policy of regional autonomy for ethnic groups is the most fundamental. Under this policy, five autonomous regions; Inner Mongolia, Xinjiang, Guangxi, Ningxia and Tibet, as well as numerous autonomous prefectures, counties, nationality townships and towns have been set up. With guidance from the Chinese government, the ethnic groups in areas that have been given regional autonomy are entitled to deal with their own affairs. 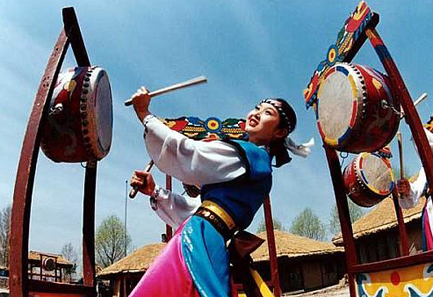 Together with the Han people, the Chinese ethnic groups are making great efforts to build a prosperous China.